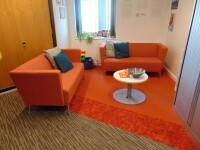 Related link The Sir Michael Cobham Library. 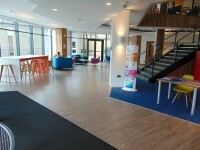 Talbot Campus can be reached from the North or the East via the A338 (locally known as Wessex Way). Take the exit at the Richmond Hill Roundabout (next to the Pruhealth tower) and then follow the signs for Bournemouth University. From the West on the A35 follow the signs to Bournemouth (A3049), taking the dual carriageway (Dorset Way) past Tower Park. 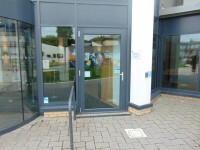 Talbot Campus is located on the A3049 (Wallisdown Road). 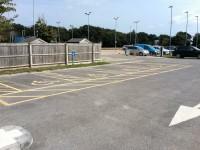 Parking on the Talbot Campus is limited and the car park is pay and display. 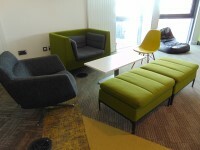 For sat nav users, the postcode for the Talbot Campus is BH12 5BB. There is a parking provided around the Talbot Campus. Wilts & Dorset Buses As part of the local transport network, Wilts & Dorset Buses operates a student-oriented service. This service provides transport between our two campuses and extends to areas populated by students in Poole, Bournemouth and Boscombe. Term-time: Services run every 10 minutes during term-time and timetables are available from all main reception desks. Vacation Times: The U1 Bus service is in operation during university vacation times, running between the Lansdowne Campus, Cranborne House and the Talbot Campus every 30 minutes. 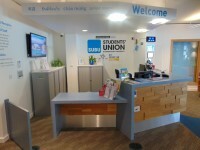 The nearest rail station to Talbot Campus is Bournemouth. The fast train service from London to Bournemouth takes around one hour and 50 minutes. From the station, Yellow Buses run services to the Talbot Campus or you can catch a Wilts & Dorset bus by walking to Dorchester House. There is a taxi rank at the station, and a taxi would get you to Talbot Campus in around ten minutes. The website for Yellow Buses. Information on Bournemouth Station from National Rail. Bournemouth Bus Station DisabledGo Access Guide (new tab) - click here. Bournemouth Station DisabledGo Access Guide (new tab) - click here. To see more information on Disability & Additional Learning Support please click here (opens new tab). The name of the car park is Visitor and Events Car Park. 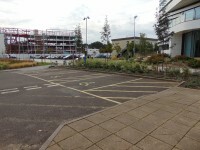 The car park is located at the rear of the campus. You are on Site/Campus Car Park (Visitor and Events Parking). Skip to the next section. 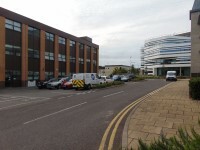 The car park is located to the right of the Talbot Building. The nearest building(s) to this car park is/are Talbot Building. The Blue Badge bay(s) is/are clearly marked and signposted. There is/are 4 designated Blue Badge parking bay(s) within this car park. 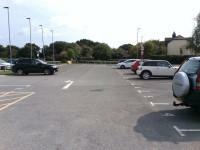 The dimensions of the designated parking bay(s) are 340cm x 610cm (11ft 2in x 20ft). 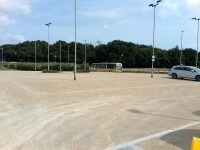 This car park can be used by visitors and permit holders. Parking charges apply for non permit holders. 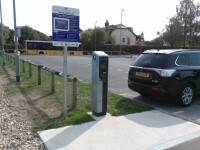 Payment machines are located close to the Blue Badge parking bays. Payment cannot be made by phone. There is a designated drop off point in this car park. 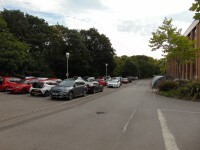 There is sloped access to the car park from the campus via unnamed road at the rear of the Campus Gillett Road. This car park is not clearly signposted from the Talbot House. The nearest designated bay is 25m (27yd 1ft) from the Talbot House. You are on Site/Campus Car Park (Car Park D and E). Skip to the next section. 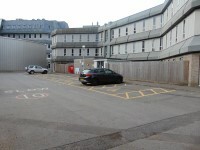 The car park is located to the rear of Weymouth House and Dorset House. The nearest building(s) to this car park is/are Weymouth House, Dorset House. There is/are 11 designated Blue Badge parking bay(s) within this car park. 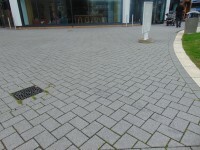 The dimensions of the designated parking bay(s) are 400cm x 550cm (13ft 1in x 18ft 1in). The dimensions of the designated bays do vary in size. 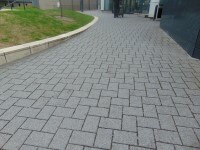 There is sloped access to the car park from the Talbot Campus. This car park is not clearly signposted from the Kimmeridge House. The nearest designated bay is 5m (5yd 1ft) from the Weymouth House Rear Entrance. The width of the door opening is 107cm (3ft 6in). The ramp/slope is located on either side of the building. 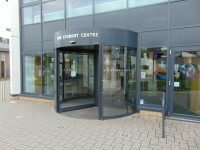 There is a central large automatic revolving door in the centre of the front of the building adjacent to the main entrance. 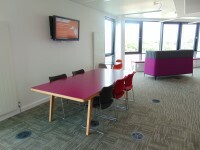 The Lady Cobham Link Bridge off the main core on floor 3, leads to the Sir Michael Cobham Library. 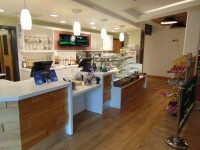 You are on Eating and Drinking (Ground Up Union Cafe). Skip to the next section. 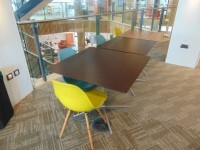 The distance between the floor and the highest table is 101cm (3ft 4in). 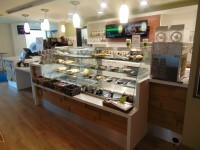 The type of food served here is hot and cold sandwiches and snacks. 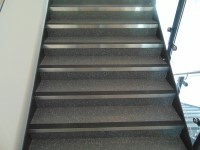 The floors which are accessible by stairs are G, 1, 2, 3, 4, 5. 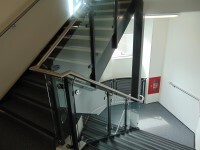 The stairs are located ahead as you enter in the centre of the building. 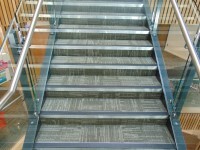 The stairs are approximately 6m from the main entrance. There is an additional similar staircase at the rear of the building with heavy double doors to access the stairwell on all floors. 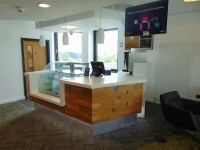 The lift is located ahead as you enter off the Union Café seating area. The floors which are accessible by this lift are G, 1, 2, 3, 4, 5. The weight limit for the lift is 1000kg. The lift is approximately 16m (17yd 1ft) from the main entrance. 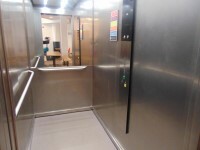 The dimensions of the lift are 111cm x 210cm (3ft 8in x 6ft 11in). 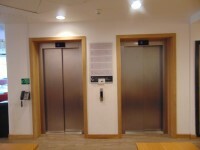 There are two similar lifts next to each other. 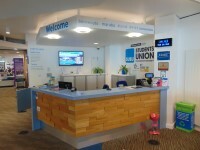 You are on Reception (SU Reception). Skip to the next section. 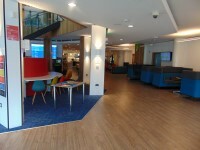 SU reception is located to the right as you exit the lift on the first floor. The desk is 4m (4yd 1ft) from the lift. 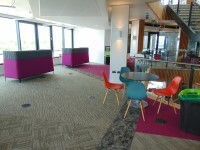 The reception area is clearly visible from the lift. 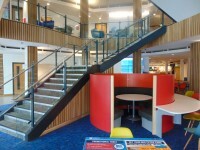 There is step free access to this reception area, via lift. 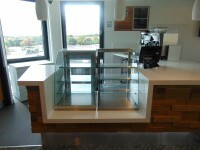 There is a clear knee recess beneath the low/lowered counter. 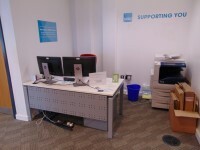 You are on Reception (SUBU Advice). Skip to the next section. 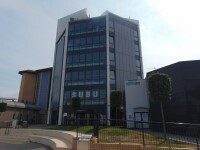 SUBU Advice is located on the second floor to the left as you exit the lift. The desk is 5m (5yd 1ft) from the lift. You are on Eating and Drinking (Ground Up). Skip to the next section. 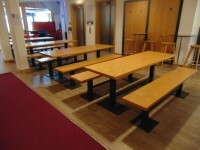 The nearest table is 4m (4yd 1ft) from the lift. 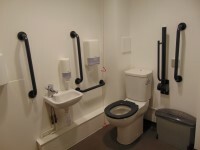 The accessible shower(s) surveyed is/are located at the rear of the ground floor past the Union Cafe. 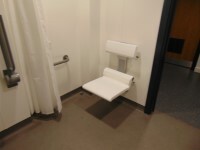 The facilities available in the accessible shower(s) include; an adjustable shower head, handrails and a flip-down seat. 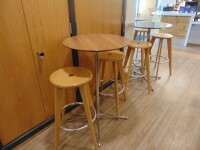 The height of the seat is 41cm (1ft 4in). 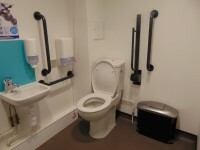 Other facilities available include; a similar dry chair with an adjustable height seat, drop down rails and pull chord emergency alarms. This accessible toilet is approximately 4m (4yd 1ft) from the lift. This accessible toilet is located to the left as you exit the lift on the fifth floor. There is a similar toilet on the ground floor with the transfer space on the left, located at the rear of the building past the Union Café. There is a similar toilet on the first floor ahead as you exit the lifts. There is a similar toilet on the second floor with the transfer space on the left. There is a similar toilet on the third floor which has no clear 150cm by 150 turning space. There is a similar toilet on the fourth floor in a similar location. 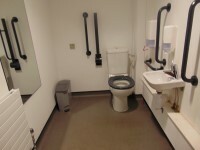 The dimensions of the accessible toilet are 155cm x 205cm (5ft 1in x 6ft 9in). The height of the coat hook is 104cm from the floor. 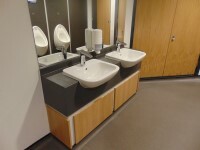 There are male and female standard toilets facilities on the ground floor and the third floor. 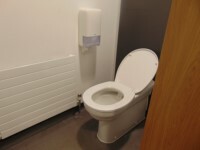 There are shared standard toilets facilities on the first floor, the second floor, the fourth floor and the fifth floor. The toilet surveyed is located on the fifth floor to the left as you exit the lift.